Tricks and Tips to Store Ink Cartridges When Not in Use! Be it home or office, ink cartridges are amongst the most frequently used consumables. But do you have to keep replacing the ink cartridges used at your office every so often? Whatever be the reason, be it drying out of the ink or any damage caused to the cartridge, replacing your ink cartridges frequently can become extremely expensive. It can be very frustrating to know that the ink cartridges you bought some time back, is no longer working because they weren’t stored properly when they were not in use. So, if you have been facing these issues, you can now breathe a sigh of relief as you can take care of these cartridges easily and assure their long sustainability by following these simple steps. It is always advised to store the ink cartridges in an upright position whenever not in use. 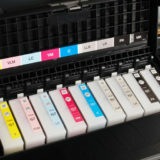 Many ink cartridge manufacturers like HP, Epson, etc. even have indicated that storing them in a proper way increases their durability and does not lead to quick drying of the ink. The simple reason for this recommendation is that downward facing cartridges can leak and if you are using multi-colored cartridges, then the ink from them can get mixed. Whenever your ink cartridges are not in use, you must keep them sealed in the packaging bags. This will protect them from any damage, scratches, leaks or drying of the ink. Another crucial reason for storing these cartridges in packages is to ensure that their head remains moist so that the air does not escape leaving them dried and useless. 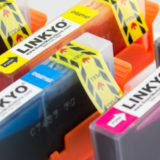 Not only this, the packaging is designed to safeguard the cartridges from direct sunlight, dust, and debris which can ruin the ink stored in them. So, remember, if you want a perfect printing experience every time you use your printer, make sure to store them in plastic sealed bags to increase their life and keep the ink texture intact. The Best Place to Store – A Cool and Dry Place! After you successfully seal the cartridges, another imperative task is to find a dry and cool location to store them. This is to assure that they do not come in contact with direct sunlight as heat can cause bubbling and foaming in the ink. Frequent expansion and contraction of the ink due to the alternative storing of cartridges in hot and cool places can damage them over time and may lead to leaks in the future. Make sure the place is dry enough and not under the coverage of moisture because humidity and moisture can ruin the ink. Direct sunlight and some of the artificial light sources can harm the ink and degrade its quality which can be noticed while printing. Keeping cartridges in cool and dimly lit conditions will increase their life and durability. If you have a commercial business that involves a lot of printing work, then it is imperative to store the ink cartridges in a proper way in order to prevent any chances of ink damage. With these quick, simple and easy storage tips, you can make certain that the ink lasts long and is readily available whenever you need them for printing. As they say, “Precaution is better than cure”; it is better to use and store ink cartridges with care rather than getting frustrated when they don’t print well.